This week, Cassandra Wilson releases her latest CD, 'Thunderbird,' ushering in what some have described as a "new and different sound" for the Grammy Award winner. "It's good to be known and to be valued as someone who is accomplished at doing something but it's also important, I think, to challenge yourself and at the same time have fun," the Mississippi native told Black Voices. 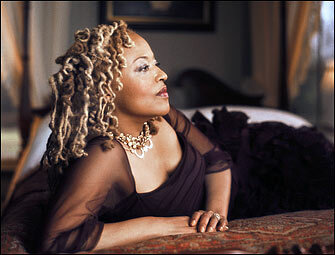 "I think the direction took me," Cassandra Wilson says of her latest album, 'Thunderbird,' which has been proclaimed as a "new and different sound" by the jazz media. Acclaimed producer T-Bone Burnett -- of Roy Orbison and Elvis Costello fame -- helmed the eclectic 10-track CD, in stores April 4, featuring new spins on traditional classics, and Wilson's own compositions. "Something I think most people know about me as a musician, I'm open to possibilities. I never paint myself into a corner because music is intimate and there are so many things you can do that are fun and exciting with it. And when is becomes a chore, you keep doing the same thing over and over again, eventually you lose, and your audience loses it as well. So I love the challenge of working with new musicians and working with a new methodology and 'Thunderbird' is a prime example of that." The Grammy Award winning jazz singer/songwriter says the album took a little under a year to record, utilizing three Los Angeles studios. "You don't just go into a studio and knock it out all in a month or a couple of months," she explained. "You have to take time to breathe and to let the project breathe. Because if you rush it, you won't give the material an opportunity to show you where it is going." The release of the new disc comes at a very difficult time for the Wilson, who turned 50 in December. She is currently based out of her native Jackson, Miss., caring for her 80-year old mother, who is suffering from Alzheimer's. "She was diagnosed the year before last and it took a turn for the worst in November so I had to come down to help manage things and to help set up the household so that she is cared for," Wilson told Black Voices. "So I've been here since November." "It has been a little bit difficult, it has been trying," she added. "But the other side of it is that it's a great opportunity for me to be with my mother at this time in her life and it's so much information that you get when you spend that time, that quality time with an aging parent. It's really a blessing. And I feel fortunate to be able to. It's heavy, but it's wonderful." 'Thunderbird' isn’t the only latest music contribution Wilson has made. She is featured on 'Confidential,' the debut album from dead prez rapper M-1, whom she refers to as "quite a character." Wilson collaborates with Q-Tip on the track "Love You Can't Borrow." Wilson, the mother of a 17-year old son, is embracing hip-hop culture. "I'm not one of those jazz purists who believes that it's an insignificant form. It's true that a lot of the lyrics are insubstantial, to say the least, but I think the methodology is fascinating. I think the ways the kids are making music now are really interesting." "It's good to be known and to be valued as someone who is accomplished at doing something but it's also important, I think, to challenge yourself and a the same time have fun," she added. Your blog is mind-bloging and dedicated to jazz art and culture.